Help CentreUsing SuperControl Managing bookingsHow do I add a reminder to a booking? 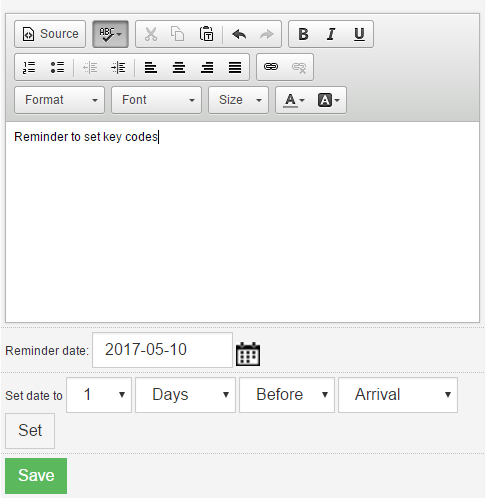 Tip: If you need to remind yourself to do something important on a booking, then set a reminder to flag up when you login to SuperControl. 3. Once you’re in the booking, click ‘Add reminder’. Enter the reminder, then schedule the days you would like to be alerted. Click ‘Save’. 4. This means when you login to SuperControl or access the booking, the reminder will flash up and alert you until you mark the reminder as complete. Prev: How do I add/edit the clean status on a booking? Next: How can I add additional dates/properties to a single booking?